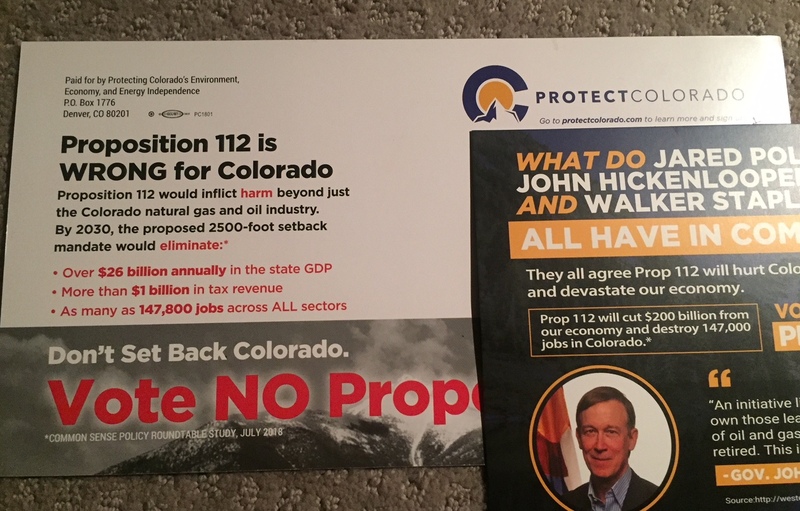 Proposition 112 is mainly about increasing the physical distance between fracking/oil gas wells and homes, schools, playgrounds and water sources. The legal verbiage is “occupied structured, water sources and areas designated as vulnerable”. This means that gas wells would need to be 2,500 feet away from those places. The current setback is 500 feet, so there are currently neighborhoods that are adjacent to gas wells. 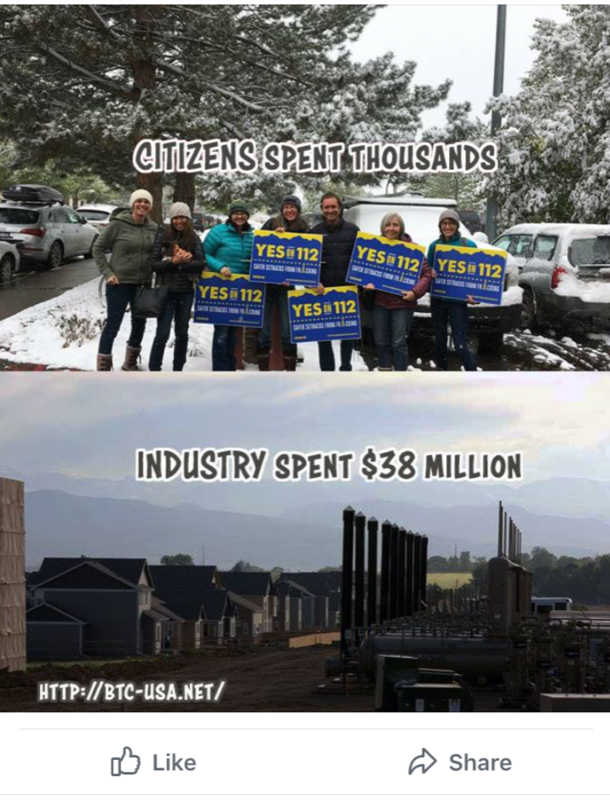 Let’s also consider that the oil and gas industry has spent $38,000,000 (that we know of) by creating an organization called Protecting Colorado’s Environment, Economy, and Energy Independence to create signs, send mailers to your house, buy billboards, and do online advertising. Some of the samples follow below. 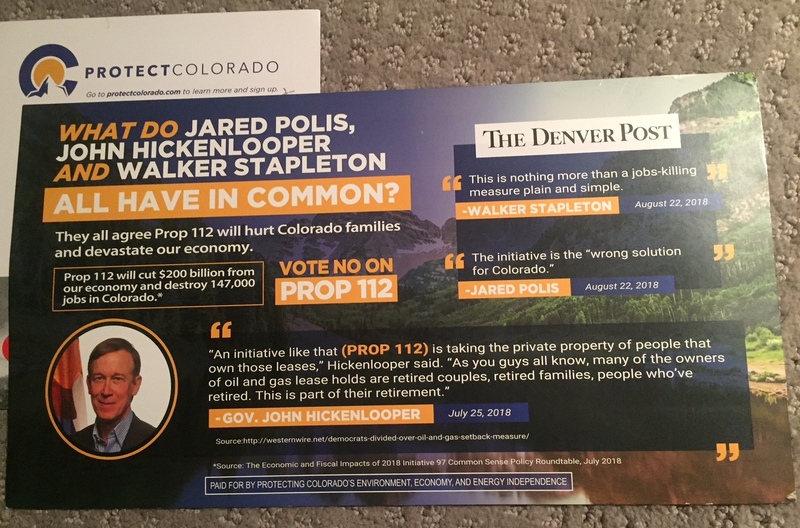 They made sure to buy the politicians, so vote yes on Proposition 112 to stick it to the bastards. They paid mainly Caucasian women to pose together to target the women’s vote. 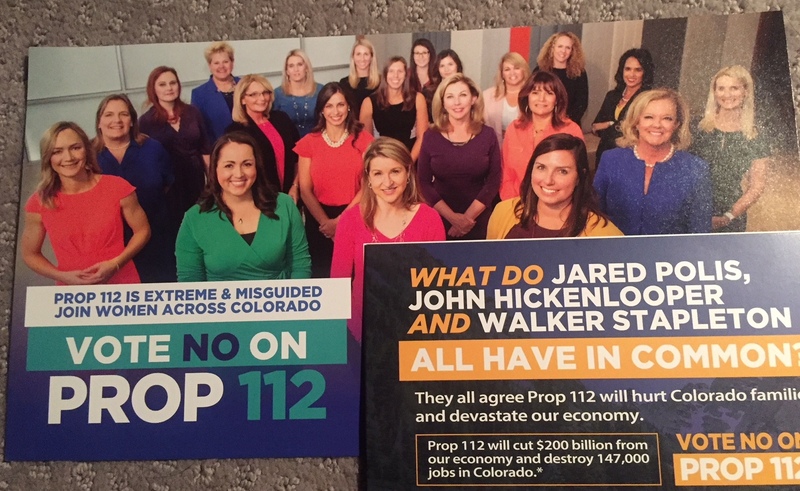 They hired a savvy marketing team to make the mailings that were sent to your home (so vote YES on Proposition 112). In true Orwellian form, the industry used schools against the notion of actually having a law that promotes healthy air and less explosions near schools. They probably created the organizations that the individuals are credited with giving quotes from. 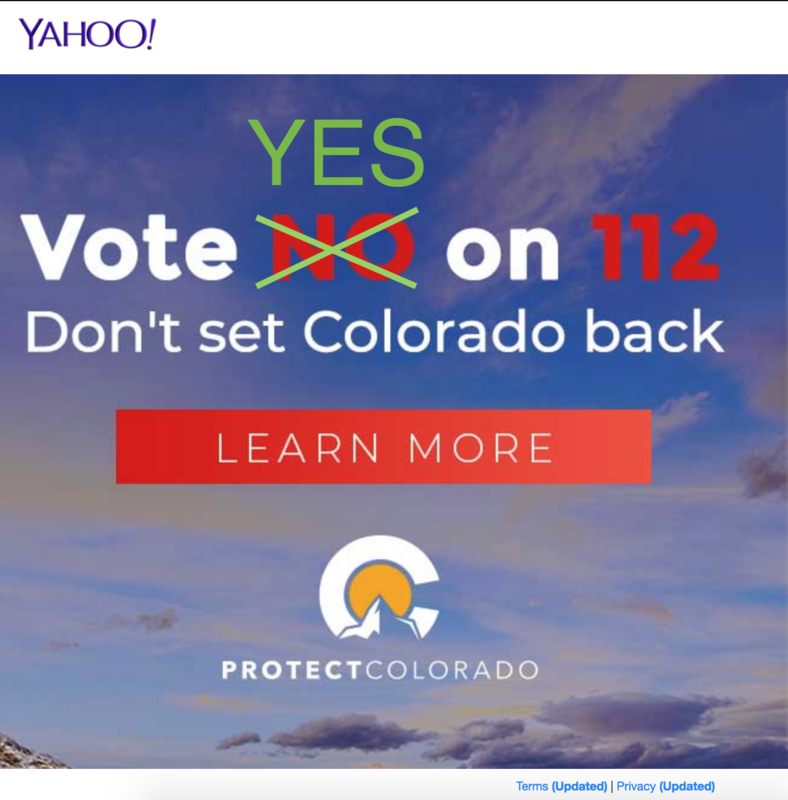 It’s kinda like spam, come to think of it (so vote Yes on Proposition 112). These are the front and back of some of them. We recycled and tossed others. And the industry spent millions on online advertising. 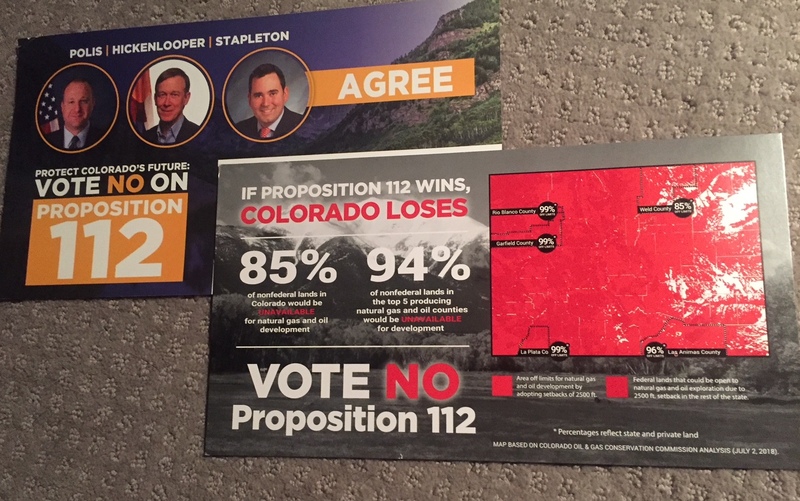 Protect Colorado and vote YES on Proposition 112. 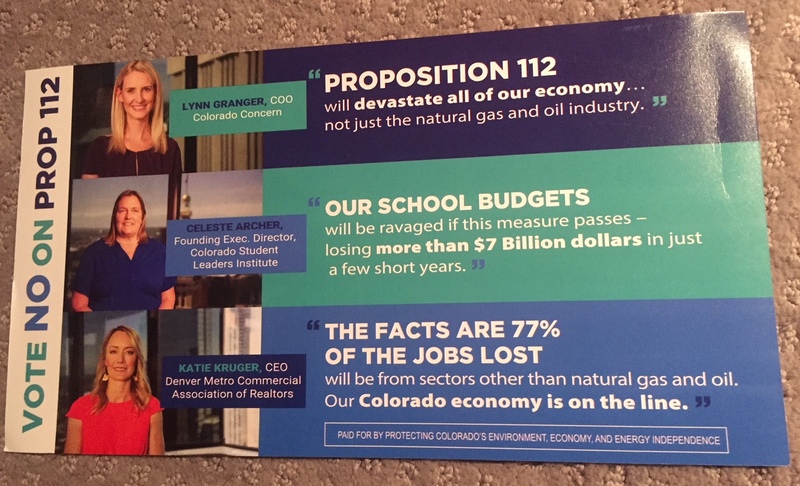 The odd irony is that it’s still not really protecting Colorado. It’s only having a setback of 2,500 feet, from the current 500 feet. So things may still blow up from gas buildup – but from a further distance away. It still may leak into water sources, but it’s just further away.